The Pew survey looked at attitudes around issues of racial equality in America and found some very different views among white, black, Hispanic and Asian Americans. WASHINGTON - Members of minority groups and whites in the United States often see the world through very different lenses, but politically speaking those differences are magnified by the blue/red divide, according to a new Pew Research survey. And that partisan split may be even more important in Washington.The Pew survey looked at attitudes around issues of racial equality in America and found some very different views among white, black, Hispanic and Asian Americans. For instance, 78 percent of African Americans said the country had not gone far enough on the issue of making sure blacks had equal rights with whites. 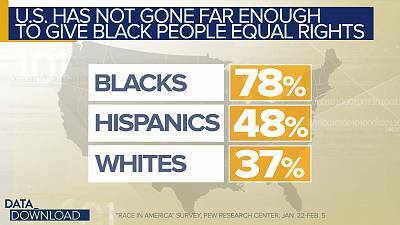 But only 37 percent of white respondents thought that was true. Among Hispanics, 48 percent thought the country had not gone far enough.On the legacy of slavery, 84 percent of blacks said slavery had "a great deal" or a "fair amount" of impact on the position of African Americans in society today. A lower number of whites, 58 percent agreed. And among Hispanics and Asians, the numbers were 67 percent and 69 percent respectively.And 84 percent of black respondents said people not seeing racial discrimination where it exists is a bigger problem than people seeing racism where it doesn't exist. Whites were the only group where a majority, 52 percent, said the opposite was true - that the bigger problem is people seeing racism where it really does not exist.Those racial splits are pretty stark, but the picture changes dramatically when you look at the same questions with white respondents broken into groups of self-identified Democrats and Republicans. The picture changes dramatically when you look at the same questions with white respondents broken into groups of self-identified Democrats and Republicans. 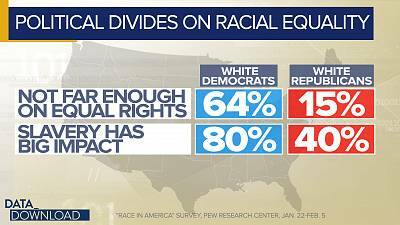 Among white Democrats, 64 percent of respondents say the country hasn't gone far enough in giving black people equal rights. But among white Republicans, only 15 percent say they hold that view.On the legacy of slavery, 80 percent of white Democrats say it's had a big impact, compared to 40 percent of white Republicans.And 78 percent of white Democrats say people not seeing discrimination is a bigger problem than people seeing racism where it really doesn't exist. With white Republicans, that figure is 22 percent.In other words, on these issues, white Democrats look a lot more like African-American respondents than they look like white Republicans. And the same kinds of differences appear when you look at how people view racial equality in real-life circumstances.On the surface, the question of how African Americans are treated on a range of important everyday situations divides pretty clearly along racial lines. 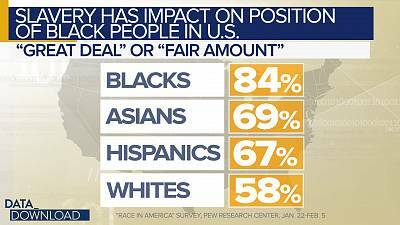 In other words, on these issues white Democrats look a lot more like African-American respondents than they look like white Republicans. A majority of blacks surveyed said they believe they are treated less fairly than whites in dealing with police, in the workplace, when voting in elections and when applying for mortgages or loans.Overall, white respondents did not agree. A majority of whites, 63 percent, agreed that blacks are not treated equally when dealing with police. 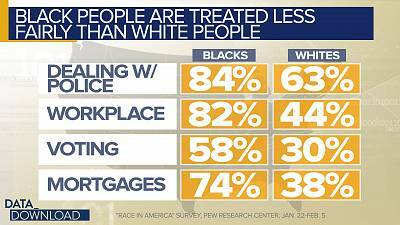 But a majority of white respondents did not agree that blacks are treated unfairly in the workplace, when voting and when applying for mortgages or loans.Again, however, those numbers for whites shift, when a partisan blue/red filter is placed over them. The numbers for whites shift, when a partisan blue/red filter is placed over them. With large majorities, white Democrats say blacks are not treated fairly in dealing with police (88 percent), in the workplace (72 percent), when voting in elections (60 percent), and when applying for a mortgage or loan (64 percent).White Republicans, meanwhile, feel very differently about whether blacks are treated unfairly on all those fronts: dealing with police (43 percent), in the workplace (21 percent), when voting in elections (7 percent) and when applying for a mortgage or loan (17 percent).In every one of those cases, the numbers for white Democrats are more than twice as high as those for white Republicans, in some cases much more.And those questions are particularly important in Washington because they deal with real-life situations that go directly to policy prescriptives.How much racism a person sees in the world may be about one's point-of-view or experience, but when the issues are differences how people are treated by police or whether someone gets a home, those are fundamental questions about equal protection under the law.And in that way, the Pew survey reveals why issues around racial equality are so complicated in DC. Changing policies are bound to be difficult when the two parties see the roots of those issues and their modern-day realities so differently.But the partisan split among whites also reveals a lot about the larger state of U.S. politics in 2019. The historical gap between the way whites and blacks view the country is still wide. 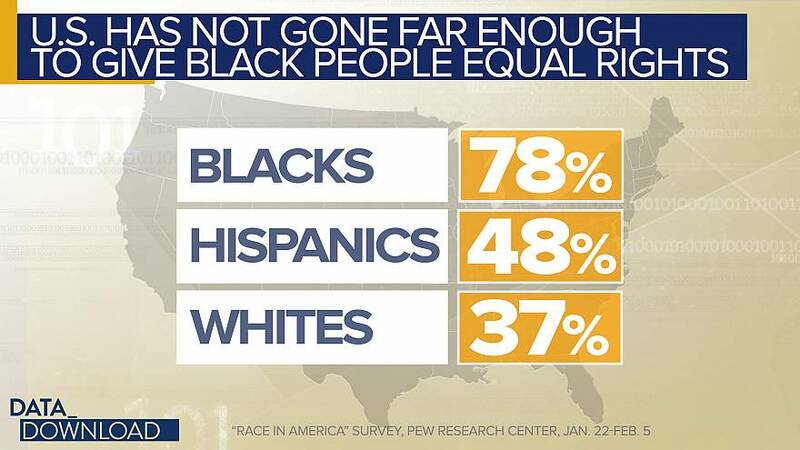 But the data here suggest the blue/red divide may be even more profound.